If you think about it, you will have to admit that we usually cook because we have to. But something that can be a chore for us, is a very interesting thing to a child. It’s like a whole new world, where things get mixed together and ordinary things are changed into something different – it is sort a magic for a child. It is a good idea to get your child involved in the kitchen – prepare a few simple meals and you will see that it will make your kitchen stay easier and more interesting. Ensure that your child see what is going on and can comfortably reach items you want him to handle. Even if there is nothing to handle and you just want him to watch, it will create a great opportunity to have a chat. What your child wears to help you cook will make a big difference. Think about purchasing a kid-size apron or a special chef’s hat. If you don’t want to purchase anything, find dad’s old shirt and make it your child’s special cooking shirt. Bonus: you will be able to keep your child’s clothes clean! If you have more than one child, figure out how to get everyone involved. The level of involvement will depend on child’s age and ability. It is quite OK for a toddler to wash vegetables for you, or a four-year old mixing ingredients. Older children can help you cut vegetables, cheese, etc. with a blunt knife or read a recipe for you. Believe it or not, an eight year old child can follow a simple recipe and actually put an entire meal together. You can also create a special set of tool for your child – his own measuring cup, spoon or coloured utensils. If you have more than one child, it may be a good idea to have a different colour utensils for each one. 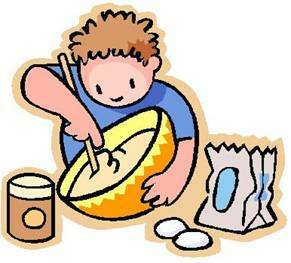 If you are making a large dish – like a casserole for the whole family, let you child make a small version of it by having him soon some of the mixture into a small baking dish – that would be just for him.You can also do that when you are baking – mini muffin or a loaf pan can be your child’s very own baking dish quite easily. One of the things kids really like is anything on a stick. It is fun to make, fun to eat and even the smallest cook can put things on a skewer. Try cubes of cheese, cherry tomatoes, chunks of ham,etc. When they are all created, you can have your child arrange them on a plate with a small bowl of mustard, mayo, dressing or any other dipping sauce you can think of. The one thing you will definitely need is your sense of humour. If something gets dropped or spilled, remember that it is all art of the process. And for sure – you can involve your child in a clean up – that will prepare him well for future endeavours! Grease an 8-cup ovenproof casserole with a lid. In the prepared casserole, combine macaroni, onion, tomatoes, cheese, water, salt and pepper and stir to combine well. Place the lid on the casserole and bake for 1 hour, opening the oven and giving the mixture a stir about halfway through the baking time. Meanwhile, melt butter in a small skillet over medium heat. Add bread crumbs and cook, stirring, for 8 to 10 minutes or until the crumbs are lightly toasted. After the casserole has baked for 1 hour, remove the lid and sprinkle the buttered crumbs over top. Return to the oven, place under the broiler element and broil for 3 to 5 minutes, until browned. Mix together all the ingredients in the casserole dish. I hope you cook with your children – it will become a very special time very quickly! And please send me your comments, suggestions and experiences, your input is very welcomed and much appreciated!